I first started reading the Fantastic Four during John Byrne's run. Lots of great material there, and that's what really got me hooked on the characters specifically, but comics more generally. Byrne worked on the book for a couple more years before he bowed out just before a couple of big anniversary issues. Much as I didn't want to see him leave the book, by the time he did, I understood that his long tenure as the writer/artist on a single book was unusual. 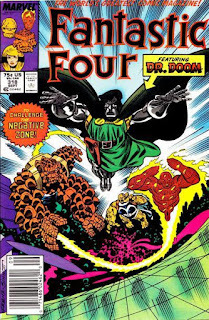 So then there was a period of creative change-ups until Marvel found a regular creative team, but since John Buscema was doing most of the artwork, I didn't mind. They eventually landed on the team of Steve Englehart and Keith Pollard. I didn't initially care for dropping two of the main characters and replacing them with love interests for the remaining two. But once some of that seemingly forced soap opera-y stuff got out of the way, there were some decent stories going. Even the "Inferno" stories weren't too bad for being part of an unnecessary crossover. But then this John Harkness guy started writing the book. The Fantastic Four were captured, an evil clone version of the team replaced them, and readers got several months of nothing but dream sequences. I was thrilled when Walt Simonson finally took over with #334. Of course, what I didn't know at the time was that Englehart and Harkness were the same man, and that he was using a pseudonym because he himself didn't like what he was being told to do with the stories. So what was being done? The FF was always the "real life" adventures of superheroes, but as the series atrophied many people forgot about the real life part; growth and change went out the window. I identified the hermetically-sealed group of Reed & Sue & Ben & Johnny as a main reason the book has grown stale - and Reed & Sue had been saying for years that they should pay more attention to their perpetually 6-year-old son Franklin - so I let 'em. Thus, Ben & Johnny had to find two new members and do new things. A few months after Englehart began, however, Shooter was fired and Tom DeFalco was given the editor-in-chief role. Initially, he seemed to leave things alone, presumably as he was getting a handle on the new job. But when the next Annual came around -- which tied into the "Evolutionary War" story that ran through many of the 1988 Annuals -- DeFalco evidently started demanding changes that book editor Ralph Macchio put in place. As always, I did the best I could, because the fans ought not to suffer in these situations, but anyone reading them with the knowledge of what was going on will find them filled with cries of outrage--not the least of which was the entire plot. Alien freezes real FF, sticks 1962 FF in their place -- the man who raised stealing from Jack Kirby to Official Policy never got that, and if you understand that fact, you understand everything that's gone wrong at the House of Ideas. In fact, the 1962 FF was such a hit in the offices, they want to do a mini-series starring them. Almost all the 1962 FF's dialogue in the series was lifted verbatim from FF #1-3, by the way; it actually took a lot of extra time to make that work, but that's what their stunted characters required. Anyway, the dream stories at the end were bare bones versions of the stories I would have done for real if I'd been able to; the last one, how Frank made Alicia leave Ben for Johnny, was the plot that got me the FF in the first place (over the then-not-in-charge Tom DeFalco). In one of my early FFs, back when they had letter columns, I said I had a long term plan working for the book; that was the first half of it. But in the end, as the titles very clearly said: "Bad Dream--And You Can't Wake Up!" Why did Steve leave the book? We had a parting of ways, creatively. I remember there was a storyline he embarked on and I knew right away that we were beginning to see the characters differently. There were stories he wanted to do that just didn't work for me. I liked a lot of his run, but I didn't like the way he wanted to go so I made a change. Maybe he didn't see it that way, or simply believed that he could do both. The stories aren't terrible. The dream sequence stories were fairly good, aside from being dream sequences. The rest was a muddle, but no more than a lot of Marvel product (including most of the DeFalco era FF). On the other hand, perhaps the oddest twist to this whole affair was that it ultimately ended with Englehart's replacement by Simonson… whose stories seem just as inventive and iconoclastic as Englehart's, while being noticeably more fun. I feel like this was Englehart's biggest failing (and that of many who've written the book), whatever the Marvel editors thought. Writing Fantastic Four with a sense of fun that actually feels fun is much more difficult than tacking on some "fun" aspects to soapy melodrama. The dream sequence bits that really bugged me (again, outside of the fact that they were dream sequences in the first place!) was the cat fight between Sue and Crystal, and the abruptness of Franklin's "hey, I made everybody love somebody else" resolve. The former seemed wildly out of character for both of them, and the latter I just don't think was executed very well. Probably in part because Englehart was deliberately trying to shoehorn a longer sub-plot into such a truncated space. For as maligned as the DeFalco/Ryan issues are, I found them to be quite enjoyable. Largely because of that fun factor you mention. They come across as having been written in a hurry with no sense of the long-term plot, and from my understanding, that's because that's how they were actually written. So there are definite problems with dropped plot points, whiplash-inducing directional story changes, and that dreaded peak-a-boo outfit Sue had for a while. But I do think they generally captured the spirit of the characters (Sue's costume choices aside) and there did seem to be a greater sense of fun. Complete agreement on the two (or three) chief "Dreamquest" failings. DeFalco/Ryan issues… boy, I'm trying to remember them now. I struggle to recall many stories that felt particularly fun. For what it's worth, perhaps the best comment I can make on that era is that the last couple of issues before the "Onslaught" crossover stand out in my mind as one of the most fun episodes. I suspect that this was because they were an accelerated conclusion to plots that would otherwise have dragged on forever (had it not been for the Heroes Reborn event). Otherwise, it frequently felt like the whole era suffered from an X-men influenced aversion to any sense of resolution on anything, ever. How about the irony of the fact that Tom DeFalco made Englehart bring back Reed and Sue, and then a few years later DeFalco went and killed off Reed and Doom and appeared to have no real intention of bringing them back, until he was forced to because he was being removed from the book with Heroes Reborn starting. On Business: One Day or Two? On -isms: What's Not So Funny About the Funnies? On History: The FF's Anniversary is NOT August 8!